This really isn’t my cup of tea but since Aki is too busy I decided to try writing a Magic article. I’m nowhere near as experienced in this as Aki is but don’t worry. I’ll ask his opinion on this. On the top of this I must admit that I’m more inclined to build decks with a theme rather than ultimate power level. But that’s ok since Leovold, Emissary of Trest just screams “elfball!” to me. 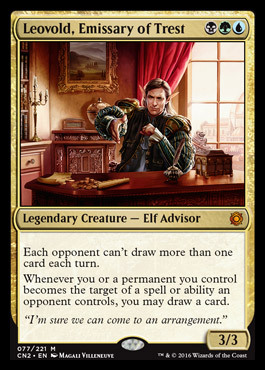 Leovold might not be the most impressive of Sultai commanders there is but he does allow you to build a new kind of elf tribal mixing the most powerful colors in EDH. He does have some appeal to tiny leaders as well (apparently there haven’t even been one yet). The first ability allows me to use group hug card draw to gain an upperhand. Cards like Prosperity and Minds Aglow do give our opponents an extra card but your advantage is bigger and Dictate of Kruphix even Howling Mine work like charm with Leopold. To get the elves up and running I need to find balance for the draw engines and the number of elves. When building elf tribal I need to consider their inherently weak stats. So as always elf balls need to start with anthems and lords. This time we can use all of them. One card I have been aching to get is Master Biomancer. He’s not a lord but still could potentially prove insane. While on board he makes every new elf a bigger threat and they’ll stay that way even if he gets removed (and he will get removed). Since three colors can be problematic for my manabase I think I should be running more land tutors than basic Llanowar Elves or can tap for suitable mana. This means I might not get as much fast mana as I should but fixing the base will make things go smoother. Even Civic Wayfinder works better in this deck though I usually do not include it. Most elf balls work with untapping the creatures for sick amount of mana. This time I also have more tools to play control but that’s not really my kind of a thing. So I’ll try to maximize the ball effect by using legendaries as they are always fun. This means I need to make space for Time of Need. Tutoring can be boresome though so in addition to that I’ll limit it to most essential ones. As for the legendaries I’ll include Edric, Spymaster of Trest since envoys really need the knowledge as a well as Ezuri, Claw of Progress. Even though he might not be as good as a commander he is another big threat on the board calling the opponents to spend their counters and/or removal. Momir Vig, Simic Visionary might not hit as many cards as he could, but hey! It’s a Worldly Tutor quite likely each turn. The list of usual suspect for elf tribal is a long one and we cannot include all. I’ll try to keep my elves attacking as much as possible rather than pumping for mana though so that narrows it down a bit. It’s more or less guaranteed that this deck will draw out a lot of counters and removal so I need at least a few tricks to survive wipes and elimination of key cards. These cards decrease the amount of playable elves so I cannot include too many of them either. And since this is EDH I do need some removal as well. With these choices I have the basics covered and can pick the rest from my personal favorites. This entry was posted in Magic: The Gathering and tagged commander, Conspiracy, edh, elf, elf tribal, elfball, Leovold, Magic: the Gathering, mtg, sultai, Trest, tribal, Zweihänder by Lauri Maijala. Bookmark the permalink. Wilt-leaf liege cannot be in this deck, there is white mana in its cost. Apparently there was some mutual editing in this one. I removed it but Aki must have been adding the mana base at the same time. Consider it fixed. I was wondering how this has been playing? Yeah… Leovold’s price jumped so high before I got it that I never really tested this out. I would have to assume that since it’s elf ball, it will work but it is not tier 1. Maybe not even tier 2 without tweaking.